A spooky skeleton meets the Strat-O-Sphere plot. What a great idea for a prop and presentation! Three blocks with images of a skeleton are placed, one at a time, into a "haunted house." Even though you put them in, feet, body, then skull, the tricky skeleton gets all mixed up! How do you fix the mixed-up bunch of bones? Add a touch of magic, of course. Check out the video at the top of the page and you'll see the great prop that AmazeKids' Partner Imagin-If Magic has made so you can do this easy magic trick at kids' parties and Halloween celebrations. The beautifully made hard plastic blocks and cover stand over 12" tall. 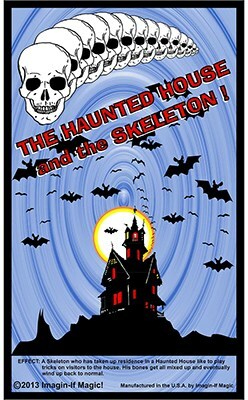 The tough, long-lasting decals really pop and will make the Skeleton and the Haunted House one of your favorite "spooky" mysteries to perform for children.